The 2x2x2 Rubik's cube is much easier to solve than the standard 3x3x3 model, but many of the subtasks are similar. You still have to follow a process or set of rules (algorithm) to get the cublets to the right position and another algorithm to orient the cublets so that the colors are on the correct sides. As for the larger cube, the last level is the hardest because you have to develop process steps that do tasks like swap corner cubes without messing up the already correct lower levels. But learning how solve the easier Rubik's cube will help you master larger ones. Solve the first layer without using any corner-switching algorithms. Unlike the 3x3x3 model, the 2x2x2 cube has no fixed center cube, so any side can be whatever color you desire. Most people choose a side that already shows several cubelets of the same color. Only two algorithms are needed to solve the first layer. One algorithm brings the proper cubelet under its desired position. The other algorithm brings the cubelet up into the proper orientation. Learn the system for notating algorithms. The names for the faces are U for the upper level, D for the lower level, L for the left face, R for the right face, F for the front face and B for the back face. Naming a face indicates turning the face clockwise if you are looking straight at it. Turning a face counterclockwise is indicated with a number 1. Turning the face two times in either direction is indicated with a 2. So the algorithm U F1 D2 R means: "Turn the upper face clockwise, then turn the front face counterclockwise, then turn the bottom face two times in either direction and finally, turn the right face clockwise." At each point, remember that you are looking at the face that is being turned. Set the corners in the cube's bottom level in their proper place. To do this, you need to know just one corner-switching algorithm. Look at any face – while keeping the solved face in the U position – and switch the lower right front corner with the lower right back corner with this algorithm: R1 D1 R D F2 D B2. Keep doing this until all the lower level cubelets are in the proper positions. After you have solved the top level and the bottom corners are in place, one more algorithm will help you finish the cube. You need to orient the bottom cubelets correctly. Alas, there is no reliable series of steps for rotating one cube on the last level. All the algorithms here rotate three cubes, so it will take some creativity to get them all in their correct places at the same time. 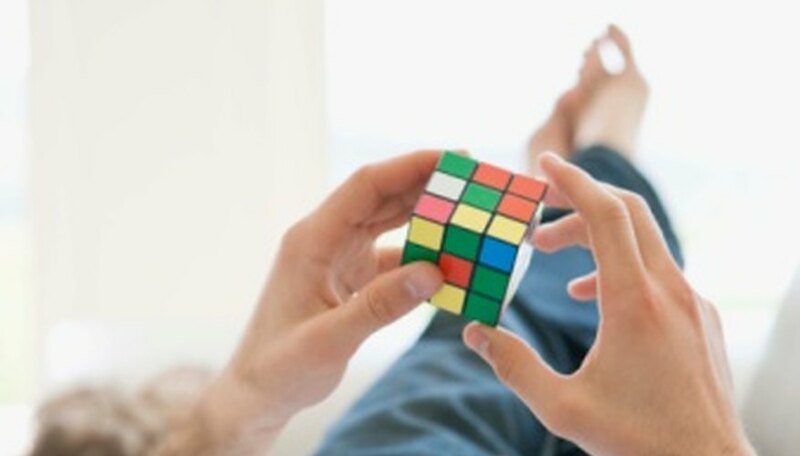 How Do You Beat the Rubik's Cube?